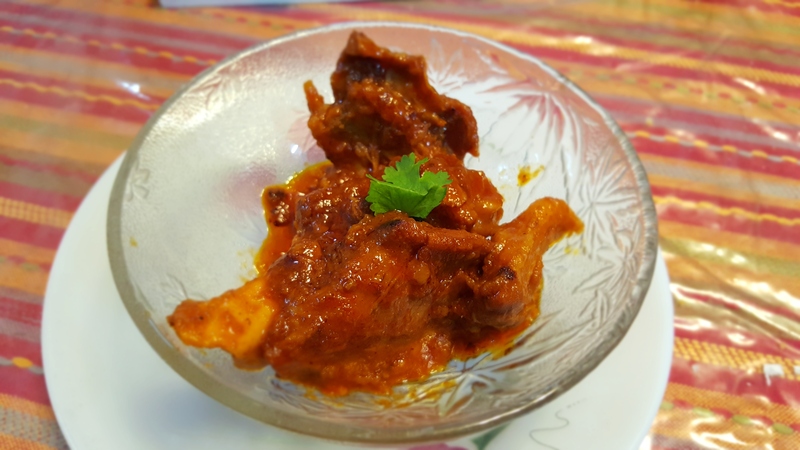 Bhuna Gosht is basically a dish of lamb cooked in whole Indian spices along with chillies and onions to give a pot roast flavour and make the lamb succulent to extract juices on your palate. Take a large skillet/pressure cooker and put oil in it, when the oil is hot drop in the cinnamon, cardamom, peppercorns, bayleaf and when the spices started to aromatize add the onions in the skillet and mix well. Reduce the heat and once the onions are golden brown add the lamb/mutton and stir well to make it pot roast. Add the green chillies and cook for 15 mins with lid on. As the lamb release juices add the ginger garlic paste and mix well. Add the red chilli powder, salt and turmeric and cook for 10-15 mins. Add the tomatoes and cook again for 10-15 mins on medium flame. Once the meat is starting to get tenderize and the gravy is separated from the oil, add the yoghurt and mix well. Check the seasoning and add kashmiri red chilli powder. Add 1 cup water and then pressure cooks it to make the meat succulent. After one whistle open the lid and cook for 10 mins to reduce the gravy so that it starts to coat the meat. Garnish with fresh coriander and serve with assorted Indian breads.